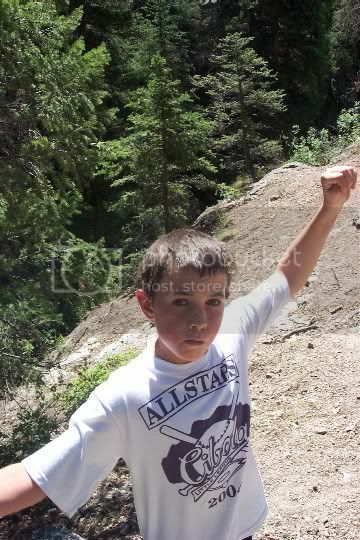 So, here are the pictures from the camping trip. If and when I can figure out where to post video stuff to, I will also shove up some of the video I took of the kids cliff jumping. Anyway, if you have dial-up, click the link, and then find something to do for the next few minutes. There are only 9 photos this time, but still for you poor poor people on dial-up, this could take a while. 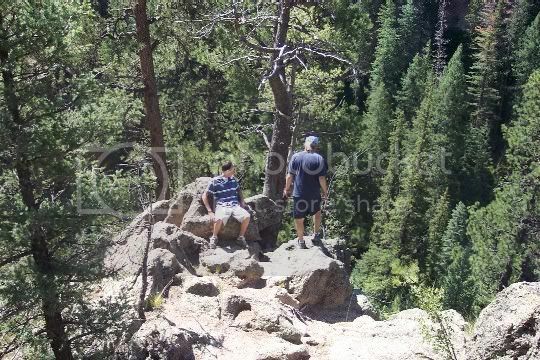 So, this is from when we went hikeing over at Jemez Falls. It was very nice there, and made for a great hike. In this picture, you can see Al and John looking down at how far they would fall if they fell. This is Al and Dillion. 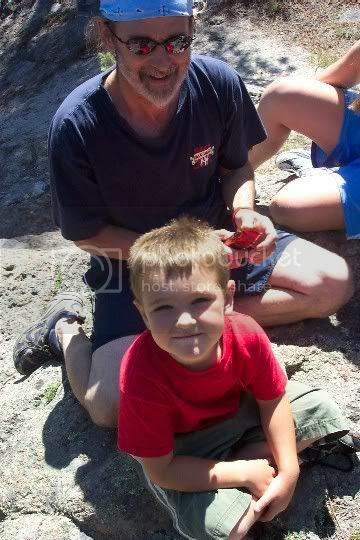 Dillion is the son of someone who was on the trip. He was so much fun to be around. Granted, Al can act just like Dillion who is 5, so that must explane why they got along so well. 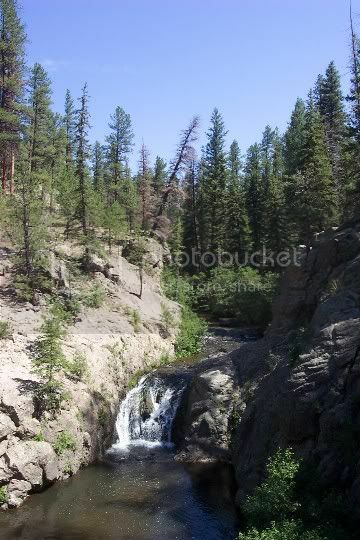 This is a picture of just one of the falls over at Jemez Falls. I did not get pictures of it, but some of the kids waded out to that fall, and found a hole in the water, that they could jump into. I waded out there, but did not jump in the hole. 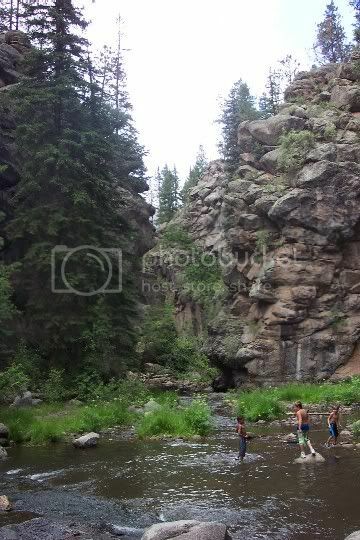 So, more Jemez Falls picture. 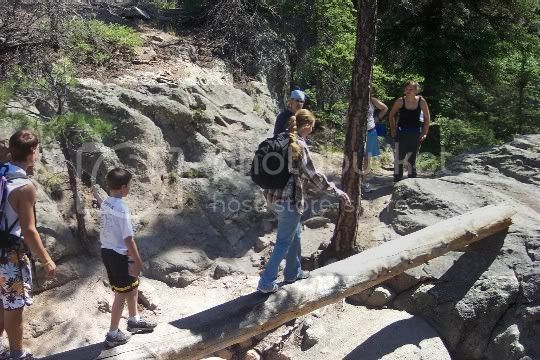 Here we are crossing this formation on a tree that fell. This is Liem. He is so much fun, and also from COJ. He also has more engery then I think I have ever had. It's kids like him that are making me feel old, and really quick too. 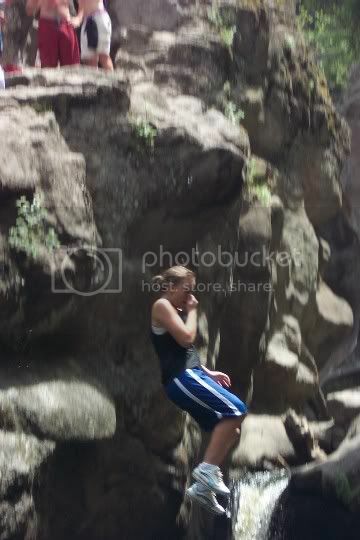 So, this is from after lunch, when we hiked in two miles to go cliff jumping. It was such magic being back in there. It was unreal to look at the landscape. 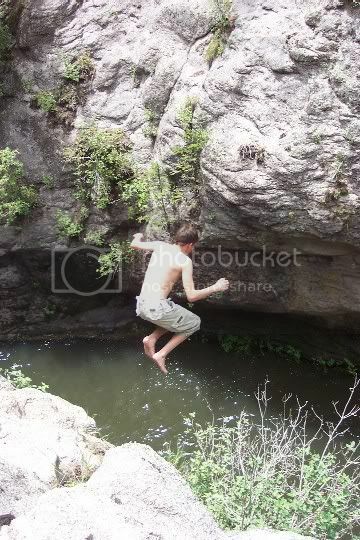 John cliff jumping. I also have video of him jumping, so when I find a place to upload that, I will. 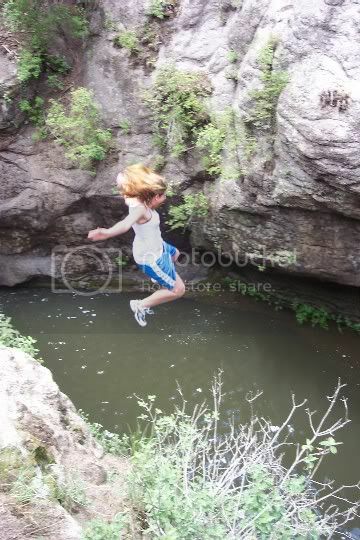 This is Jessica cliff jumping. She screams sooo loud its funny. I also got that on video also, and laff everytime I play it. Last, this is Erin. When she jumps, she just jumps. No waiting, no thinking, she just goes for it. And unlike Jess, she does not scream when she jumps. Erin was hard to get photos of, cus once upthere, she would just jump, and give no time to setup the shot.